Tula’s Institute offers a wide variety of courses to choose from and is ranked among the best EEE engineering colleges in Dehradun, Uttarakhand for students applying for both under-graduate and post-graduate programs. The department offers four Year Engineering program approved by AICTE & Affiliated to Uttarakhand Technical University, Dehradun. The course consists of 8 semesters. The progress of the student is monitored semester wise through two Sessional Exams (Internal) and one End Semester Exam conducted by the University. All the exams consist of testing theoretical knowledge and practical implementation both. Electrical and Electronics Engineering department is proud to possess the following laboratories. All laboratories are being well equipped and regularly upgraded according to the curriculum requirement of the University. The over-all exposure combined with the state of the art infrastructure has resulted in Tula’s Institute being considered as one of the best options for students pursuing B.Tech in Best Engineering college in Dehradun. To produce competent Engineers and Professionals to enable industries achieve global benchmarks. To develop skilled Electrical Engineers with good proficiency in both software and hardware and adeptness to handle various challenges posed by the industry and the competition. To offer an updated curriculum covering latest advancements to allow our students to exploit emerging opportunities efficiently. To provide real-time working experience by simulating the real world in a lab environment using latest software tools. Electrical engineers develop and oversee electrical systems and equipment. They work with everything from power grids to computers and telephones to cars. Electronic engineers, on the other hand, look after and maintain electronic equipments. 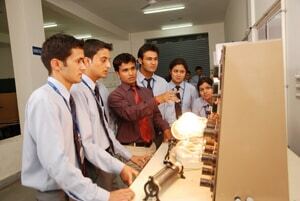 Almost all the industries are highly dependent on electrical and electronic engineering. Like every other industry in India, the electric/electronic industry too has benefited a lot from the de-licensing and de-regulations that the government has allowed. Now with exposure to global players and competition, the Indian companies have improved the quality of production and are growing to their true potential. This, in turn, means better job opportunities for electronic and electrical engineering graduates. Qualified engineers are getting absorbed across industries and sectors and will continue to do so in future. Those who are academically oriented can also take up teaching and research and development in one of the many engineering colleges in India or abroad. Electronic engineers can start their own business by manufacturing electronic parts, goods and components. They can also start a repair or assembly shop for television receivers, amplifiers, recording equipment etc. Since electronics is a labour intensive and talent-oriented field, it gives high returns for a given initial investment. Disclaimer: The above information is from various reliable sources and is relevant to current industry standards which is subject to vary according to the functional changes of the industry.